LibreOffice is a free and open source office suite, developed by The Document Foundation. It was forked from OpenOffice.org in 2010, which was an open-sourced version of the earlier StarOffice. The LibreOffice suite comprises programs for word processing, the creation and editing of spreadsheets, slideshows, diagrams and drawings, working with databases, and composing mathematical formula. Here we will discuss how to make LibreOffice as service. Pre-requisites: Download and Install the windows resource kit which provides two utilities, Srvany.exe and Instsrv.exe, that allow for the creation of a user-defined service. 5. Select LibreOffice4.1 from the lists of services. "Application"="\"C:\\Program Files (x86)\\LibreOffice 4.1\\program\\soffice.exe\" --headless  --nofirststartwizard --accept=\"socket,host=0.0.0.0,port=8100;urp;StarOffice.Service\""
– Update the C:\\Program Files (x86)\\LibreOffice 4.1\\program\\soffice.exe to your original installed path. Make sure you separate each folder name with double slashes only, keeping every other details in above exact as seen in screenshot. – here the port number to listen as service is provided as 8100 you can change to any other port as required. – Be mindful about the escape characters used and keep the change limited to only the path location of installed soffice.exe file to avoid unexpected errors. 10. Right click on the LibreOfficeregistry.reg file and click on merge to add the entries into registry. 11. On the taskbar, click the Start button, and then click run. 12. In the Run dialog box, enter “Regedit” (without the quotes) and click OK.
HKEY_LOCAL_MACHINE\SYSTEM\CurrentControlSet\Services\LibreOffice4.1\Parameters and make sure below string is available exactly. 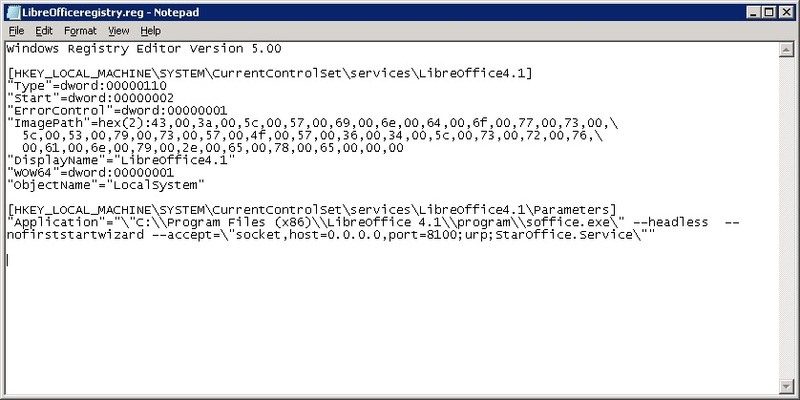 "C:\Program Files (x86)\LibreOffice 4.1\program\soffice.exe" --headless --nofirststartwizard --accept="socket,host=0.0.0.0,port=8100;urp;StarOffice.Service"
Note: Path to soffice.exe might come different according to your environment.